One of the reasons I’m drawn to particular sites is how well they are able to get down to the bottom line. I.E. if it’s a hunter site, for example, is there easy access to links showing me how to play a hunter well? The problem often comes with most sites’ desire to be both tutorial and news sites. The class/professions/general WoW news buries the “how-to” information, making them a nuisance to navigate. As such, Skill Capped is one of my new favorite sites, because it doesn’t mince words or purposes. It exists for one reason only: to make you a better PvP player. One of their contributors was recently featured on the Hunting Party Podcast, and it was welcome information to me and my 1400-at-best 2’s arena team. There’s good and bad to the site (hopefully more of the former). The good: the site features a slew of contributors from every class that know their class inside and out in PvP. There’s tutorial videos and helpful articles specifically designed toward the aspiring PvP’er. And you will know that everything you see and read there is coming from a legit PvP expert, not John Q. Faceroll. The bad: there’s a fee. $5 a month, or less per month if you subscribe for longer. The neutral: If you’re serious about improving as a PvP’er, this is one of the best sites out there, and maybe THE best. Given the amount of time and money any dedicated player spends on WoW, an extra $5 is a drop in the bucket. And for those who are still turned off by any charge, the site is functional every without a subscription. Many of the videos are available to non-subscribers, as are occasional featured utilities. So the casual BG-runner may not be interested in subscribing, but regulars in arena will likely learn a lot from this site. And either one can get something from Skill Capped, making it a worthwhile site for any PvP’er. Shared Topic: Getting Ready for Cataclysm... or Are You? This week you get two Shared Topics for the price of one! That’s right! Today’s your lucky day! So I’ve been a bit fail these days with the Shared Topics write ups. While moving and backpacking doesn’t affect my ability to keep on top of Blog Azeroth stuff, apparently working full time does. I promise I’ll do better next time. Now on with the Shared Topics of the past two weeks! The last few months of Wrath are upon us. Raids are winding down, players are taking breaks from the game, we’re all impatiently awaiting Cataclysm. Some of us are getting ready for it, some us of…not so much. How about you, asks Nexdominus from There Will be Blood, what are you doing to prepare for Cataclysm? 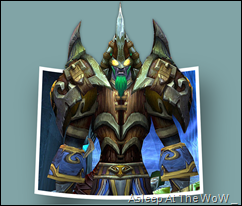 As for our latest Topic, Ardol from WoW Philosophized wants us to get up close and personal (sorta) by Sharing our favorites. Favorite what? It doesn’t matter. Just our favorites. The idea of this shared topic is to write a post about your favorite something(s). Maybe it could be your favorite movies, favorite books, or if you wish to write about WoW, your favorite quests, favorite abilities, etc. I won’t limit this to being in just list form; if you wish to expound on one particular tv show or dungeon, go right ahead. The true purpose of this kind of topic would be to help your readers get to know you as a person, but to focus on one particular aspect of who you are and what you like, and to see who agrees or disagrees with you. This upcoming week’s Shared Topic is another Cataclysm-related topic. Sort of. With slowing down of the game, the same-old-same-old-I-can’t-wait-until-the-expansion, many of us are getting to be in a bit of a slump. Many, but not all! What are you doing to keep the pre-expansion blues from getting you down? Be sure to blog about it and post the link in the thread at Blog Azeroth! What needs to die in a fire in Cataclysm? Wow.. Can’t believe it’s been 2 years already! We’re 2 years in and 90-odd shows (definitely odd).. This week we celebrate in style.. With YOU! Special Surprise? Fimlys sits on the hot seat.. No, he didn’t burn his tush.. Somehow he agrees to answer all the biting questions Nib (and the chatroom) can come up with. I think truth serum of some kind was involved. Anyway, in addition to waxing poetical about the whole genesis of this TNB thing (and just generally talking forever, as usual), the gang discusses a little more 3.3.5 information, gets you ready to be one of the first 7500 people in the queue to buy Blizzcon tickets and play YOUR “birthday” wishes and musings. Oh.. And the BEST Birthday Song EVAR! Chill Effect provides small UI tweaks, primarily to your character tab. 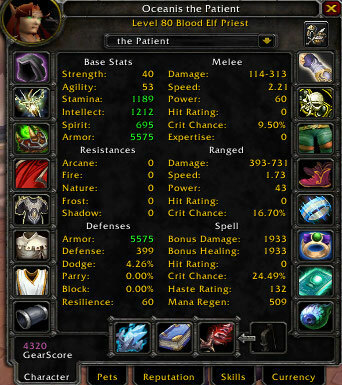 Perhaps most strikingly, it removes your character picture so that you can view ALL of your character stats on a single page (as shown below on my woefully undergeared priest alt). Now, perhaps you like staring at your beautiful Blood Elf, and this isn’t for you. But for the frankly uglier races like Tauren, Night Elf and Orc, the removal of the pic is a blessing even without the added functionality. I recently sold my soul to Blizzard to the tune of $25 for a race change in order to eek out the most dps possible. Unfortunately this resulted in my new orc hunter looking like a large green wart. I will not miss my character’s picture. Similar changes make the other tabs more intuitive as well. And there’s other small additions like new Resistances tooltips, which aid in understanding. If an add-on existed (and I will be on constant lookout) that fixed ALL of Blizz’s faulty tooltips, that would truly be revolutionary. Until then, Chill Effect won’t turn any heads, but it may help streamline your UI a bit more. Do you help new players, if so in what way? Spinks from Welcome to Spinksville! This week’s Shared Topic is about getting ready for Cataclysm. Are you ready for the next expansion? What are you doing to prepare for the leap? Write about it and share in the Blog Azeroth Shared Topic forum! Want a peak at some upcoming topics? Here are a few future topics to look forward to.